Online ordering was easy and my item arrived very quickly. Very prompt service, quicker than expected. Recommend you change the photo as it does not accurately define the product. Received order as expected and in a timely manner. Well packed and arrived on time. Will use RV Partshop from now on. I managed to get the cover on a dry day! 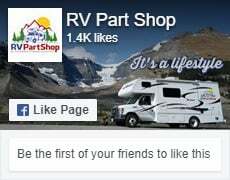 We are very happy with the quality items available from RV Part Shop and the good delivery packaging resulting in no damaged goods. Service was good given that Canada Post changed our postal code removed out box number for a street address. shipping cost expensive for such a small package which we didn'y require urgently. never actually went to the shop itself. We couldn't be happier with our purchase. Fast shipping easy checkout and we even received email updates for the status of our order. product came in a small box with both caulking tips protruding throught the box, there was no packing inside the box to prevent this! Answer: Sorry about that, we will pass along your comments to our logistics department. Thanks for the feedback. I phoned with a question and was called back promptly and helpfully. The service from your shop was A1, I received quick responses, very good service.